Atom transfer radical polymerization (ATRP) of n-butyl methacrylate (n-BMA) was performed using CuIBr/N,N,N′,N″,N″-pentamethyldiethylenetriamine (PMDETA) as catalyst and tosyl chloride (TsCl) as initiator, and different poly(n-butyl methacrylate) samples were prepared by changing the ratios of monomer/initiator and monomer/catalyst. Comparison was made with the data of another ATRP system with 4,4′-di(5-nonanyl)-2,2′-bipyridine (dNbpy) ligand (n-BMA/CuIBr/dNbpy/TsCl). 1H NMR spectroscopy was used successfully to study monomer conversion during polymerization. For lower degree of polymerization (DP) ≤ 200, the corresponding products displayed narrow molecular weight distribution (D ≤ 1.1). 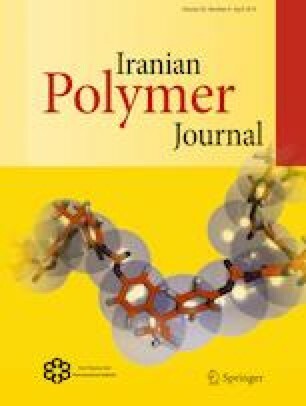 Number average molecular weights (Mn) obtained by gel permeation chromatography (GPC) were higher than those calculated (Mn,theory), while in products with higher degree of polymerization (DP = 300), the Mn,theory surpassed Mn,GPC and molecular weight distribution enhanced (D ≤ 1.25). UV–visible spectroscopy was employed to study the probable coordination of monomer to copper bromide and/or ligand. Fourier transform infrared spectroscopy (FTIR) and differential scanning calorimetry (DSC) were used for characterization of prepared poly(n-butyl methacrylate)s. Cyclic voltammetry (CV) for CuII/CuI redox couple was performed in solvent mixtures of isobutyl butyrate (saturated form of n-butyl methacrylate) and acetonitrile having different volume fractions (acetonitrile/butyl isobutyrate: 100/0, 80/20, 60/40, 40/60 and 20/80). By introducing moderately nonpolar butyl isobutyrate to polar aprotic acetonitrile, peak-to-peak separation increased. This implied slow electron transfer (lower KET in presence of monomer) that adjusted KATRP.